Human life is sacred and inviolable at every moment of existence, including the initial phase which precedes birth. All human beings, from their mothers' womb, belong to God who searches them and knows them, who forms them and knits them together with his own hands, who gazes on them when they are tiny shapeless embryos and already sees in them the adults of tomorrow whose days are numbered and whose vocation is even now written in the "book of life." 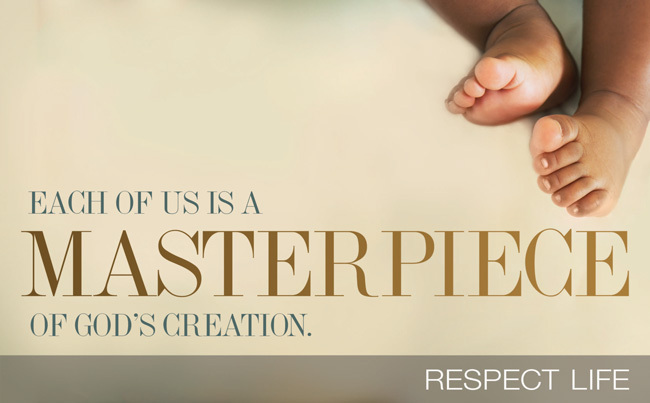 There too, when they are still in their mothers' womb – as many passages of the Bible bear witness – they are the personal objects of God's loving and fatherly providence. We live in a society of unbelief, where the unborn, the sick, and the elderly are often unwanted and endangered by acts of violence or neglect. [In 2013], we marked the 40th anniversary of the tragic U.S. Supreme Court rulings Roe v. Wade and Doe v. Bolton. Without grounding in the Constitution, natural law, or our nation's human rights traditions, these decisions made it legal to end the life of an unborn child in the United States for any reason and at almost any stage of development. Since then, over fifty-five million unborn children's lives have been taken, leaving many millions of mothers, fathers, and family members wounded and grieving their loss. Physician-assisted suicide is now legal in three states, allowing doctors to help end patients' lives rather than provide much-needed comfort in times of pain and distress. These laws pave the way for euthanasia by undermining true respect and care for people with serious illness. The Catholic Pro-Life Committee works within the Catholic Diocese of Dallas to implement the U.S. bishops' Pastoral Plan for Pro-Life Activities, working to teach respect for all human life from conception to natural death, and organize for its protection. Pregnant? Confused? Need help? Start here.